Why Your Business Needs its Own Email Domain | WAZILE Inc.
Having professional emails shows reliability, trust and credibility of your business. 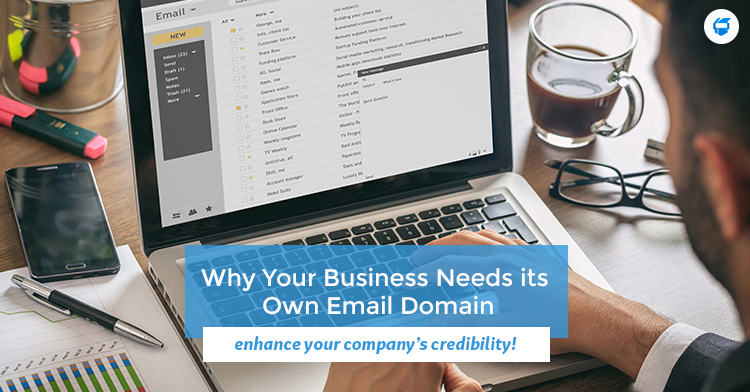 A professional email that uses your own domain allows your customers or clients to know that you’re a legitimate business. This can as well ensure your potential clients what your brand is and that you look professional. Is it necessary? If you are in a business and you want people to remember you and your brand, then this is one of the basic yet effective ways that can help you. Here’s a quick example, if you were going to contact a company that gave you three e-mails wherein you can send information that involves money and other personal details, which are you going to choose? Aside from options 1 and 2 having long e-mail addresses, those two seem a bit unreliable. Are you sure you want to send your details to the first two? Are they going to the right persons? You might be doubting and might call them to ask if they have a company email available. With option 3, you’re pretty confident that they will receive your email and that it’s a company owned email. It’s credible and it looks professional. By just having a professional email address, you are saying that people can trust you. Whether you are a startup small business, an individual that runs their own business, or a medium sized business or a large company, here are some reasons why your business needs its own email domain. Branded email makes you look professional in public and in everywhere you place or write your email. It creates a positive image for your company and allows people to remember it more. Do the first two options that were listed above seem professional? Not at all. The brand may be there but it’s not similar to the email with the brand on it. Quite similar to professionalism, users have more trust with email addresses that has a company’s name in it. When using personal emails when communicating with your business, some people might think that it’s just a part-time job or worst, a scam. There are emails that ends up in the spam folder and they are usually the ones ending in yahoo.com, gmail.com, hotmail.com, outlook.com and other email providers. Having a company emails that ends in your company’s name has less to no chance of your email ending in the spam folder. A custom email address ending with your brand can help promote your business in subtle manners. It enforces brand awareness and helps people identify you. Branding also helps in marketing whereas you are promoting your own business through email. It can set you apart from others and will maintain your professional image. First impressions are everything. Having a branded email address can boost your company’s image to potential clients that will do business with you. Do you need help with web and e-mail hosting? Contact us today for we can help you!